Who would you rather have as your nanny: Ronald McDonald or Justin Trudeau? I just read an article about the proposed revisions to Canada’s Food Guide and an article about the predatory tactics of the food industry in Brazil back-to-back and was duly infuriated by both. There were people refuting this nonsense but the fact that so many people think that the government should play no role in promoting a healthy diet is baffling to me. Most people agree that diet-related chronic diseases are a significant concern in Canada but think that the government should do nothing to help people prevent them. Then we have Nestle and other major food companies promoting unhealthy choices everywhere we go. The story of Brazil is particularly egregious but if you think that these companies care any more about residents of Canada, the US, or any other country, you’re sorely mistaken. Junk food marketing is ubiquitous, and it’s everywhere. From use of fast food as fundraisers for health charities to cartoon mascots on food products, to product placement in movies and tv shows, to sponsorship by food companies of athletic teams and events, to paid product placements in stores, and so on. People complain bitterly about not wanting the government in their grocery carts or kitchens yet they gladly throw open their doors for the food industry. So many would rather have a company that only cares about profits telling them what to eat than a government that cares about improving the health of its citizens. The government isn’t forcing people to eat certain foods and never eat others. Even if milk was removed from the food guide entirely, it’s not like you’d have to start buying black market milk on the dark web. It’s just trying to provide guidance to people to help them make healthy choices. You’re opposed to the nanny state are you? Well, we already have a nanny state and the food industry is running the show. It’s time for the government to take back some control and put industry in time-out. Tags: big food, Brazil, Canada's Food Guide, Dairy Farmers of Canada, food industry, healthy eating, marketing, nanny state, Nestle, nutrition, stop marketing to kids, vegans | Permalink. Should the government allow industry to market to kids in schools? Last week I found out about a new food literacy initiative. According to the introduction to their online survey (which unfortunately only wants input from teachers, principals, and board of education consultants) this initiative will involve visits to schools to provide hands-on healthy eating education opportunities. This initiative is an undertaking of the Dairy Farmers of Canada. I am all for getting food literacy education back into schools. I think that by educating children from a young age about growing, harvesting, preparing, and enjoying food we could prevent a lot of the unhealthy eating habits and chronic diseases that are so prevalent in our society. However, I don’t think that this should be done by any means necessary, and I see the provision of food literacy education by industry as highly problematic. This is nothing against milk, or the Dairy Farmers of Canada. Milk is a nutritious food and can (although it doesn’t have to) be part of a healthy diet. I love lots of dairy products. I still don’t think that it’s appropriate for Dairy Farmers of Canada to be providing nutrition education in public schools. Run for farmers by farmers, Dairy Farmers of Canada is the voice of Canadian dairy farmers. Dairy Farmers of Canada (DFC) is the national policy, lobbying and promotional organization representing Canada’s farmers living on approximately 12,000 dairy farms. DFC strives to create stable conditions for the Canadian dairy industry, today and in the future. It works to maintain policies that foster the viability of Canadian dairy farmers and promote dairy products and their health benefits. I think that makes it pretty clear what their mandate is. It’s not to provide unbiased nutrition education to children. It’s to promote their products to consumers. Make no mistake about it, that’s what they would be doing by providing food literacy education to children in schools. They would be marketing to the next generation of consumers. Would it be appropriate for Coca Cola, McDonald’s, or Frito-Lay to provide food literacy education to a captive group of school children? Just imagine if KFC announced that it would be providing food literacy education to children in schools. Parents and the public would be freaking out. It’s no more acceptable for the dairy industry to be given access to children in schools just because some dairy products are nutritious. It’s highly inappropriate, not to mention ironic, for any food industry lobby group to be marketing to children in schools whether it be under the guise of food literacy education or not. Tags: children, dairy, Dairy Farmers of Canada, DFC, food industry, food literacy, got milk, M2K, marketing, marketing to kids, milk, nutrition, schools | Permalink. I had a blog post all written for you lovelies, cued-up, ready to go. Then I started seeing the tweets coming out of FNCE (Food and Nutrition Conference and Expo) and I got all annoyed and tweeted what you see above because apparently I’m a masochist. That unleashed a fun afternoon of back-and-forth with fellow RDs on twitter who either don’t see conflict of interest as an issue in our profession or don’t really care. I keep being about to say “I’m sorry but…” but I’m NOT SORRY DAMMIT. You are not immune to marketing. No one is immune. Not me, not you, not anyone and if you think you are then you are the extremely rare exception or you are sorely mistaken. Many dietitians (myself included) regularly bemoan that we can’t get any respect as a profession. Do you really think that showing your influence can be bought with a free sample is helping us to become respected on the same level as other healthcare professionals? Let me tell you a little tale. Once upon a time I worked in a grocery store (yes, I was an RD at this time). In my position I was responsible for a department, helping customers, teaching classes, providing demos, etc. Myself, and others in the same role at other stores regularly received training, lunch and learns, and samples from vendors. Product knowledge is important if you are talking to customers about food and supplements. The thing is, we didn’t receive training on or samples of all brands. So which products were we more likely to recommend? The ones we’d gotten to try, the ones we felt more connected to. Sure, I never recommended a product that I was morally against (I told people not to buy raspberry ketones if they asked for my opinion)or didn’t genuinely like, but I’m sure that there were equally good alternatives to many products that I didn’t steer people toward because I had no experience with them. So, when dietitians argue that industry at conferences is fine, I disagree. Sure, walnuts and almonds are great but if they’re the only nuts there what are the chances that dietitians are going to be subconsciously influenced to promote those to their clients over nuts that don’t have representation at the expo? Yoghurt’s great and there are myriad options at grocery stores. 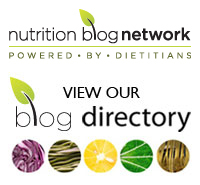 If Siggi’s and Chobani are the only yoghurt brands represented at FNCE, which brands do you think that RDs are going to be more likely to choose and recommend? Some argued that the FNCE is, in part, an expo. True enough, but as a conference organized by the national dietetic organization in the US it’s expected that most attendees will be dietitians. The focus should be on providing them with current evidence-based nutrition information.Having a captive RD audience for marketing at a conference organized by a body that’s meant to represent RDs is reprehensible. It’s time for the FNCE to drop the E.
Lest you still believe that RDs are a higher breed of human and somehow immune to conflicts of interest and marketing tactics, check out the selection of tweets below. Names and handles have been removed because this is not about singling out dietitians, it’s about drawing attention to the larger issue. Kudos to the companies present at FNCE for generating all of these free advertisements. Shame on the Academy of Nutrition and Dietetics for allowing this to occur. Tags: academy of dietetics and nutrition, advertising, AND, COI, conflict of interest, dietitians, food and nutrition conference and expo, food industry, marketing, RDs, twitter | Permalink.